180 Degree Resorts Kanatal is all about the view, the majestic view of God’s creation which gets city slickers like us travel all the way up. The cool air and the freshness complements the view to make it a complete whole. The luxurious resort situated in Kanatal at a height of 8500 ft (2590metres) is covered by snow in winters and has a pleasant weather during summer which makes one to spend best time among nature. 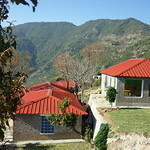 Kanatal is known for its mesmerizing beauty, beautiful sights, verdant forests, invigorating winds and tranquil weather. It presents a perfect getaway from Delhi. It’s a small little town near Mussorie, relatively unknown to the outside world. Easily accessible by road, train or even by air it provides the perfect retreat from the hassles of daily life - a perfect place to have a word with nature in its purest form.